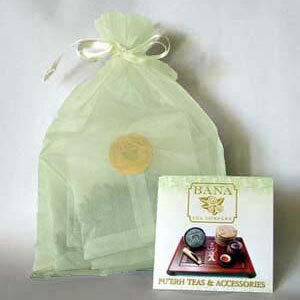 We've selected 7 of Bana Tea Company's premium raw Pu-erh teas for this set. They range from lively to mellow, from exotic to personal favorites. Our Raw Pu-erh Tea Sampler is a terrific value at only $25.00 plus shipping. We designed this beautifully packaged set to help tea connoisseurs discover the diverse flavors of Bana's raw Pu-erh teas. Packaging is suitable to present as a gift with a sheer organza sack tied with a satin ribbon. Also included in the sack is a mini brochure with descriptions on each tea as well as brewing instructions for best results. This sampler makes a great gift, especially coupled with one of our brewing accessories or a Gift Certificate. The sampler includes Bana Tea Company Limited Edition, Bulang Raw Pu-erh, Enchanting Beauty, Jinggu Bulang Raw Pu-erh, Ambush from Ten Sides, Mengsong Spring, and Little Bingdao. For more information, see individual tea descriptions below. The 7 labeled samples of tea are chipped off of our Pu-erh tea cakes or are already loose leaf. Each sample is 8 grams of tea (.28 oz) for a total of 56 grams of tea (2 oz). Produced from ancient 100 to 400-year-old tea trees, this tea presents a crisp freshness with a delicate dried apricot flavor. This young raw Pu-erh offers a smooth, medium-body, and slightly grassy flavor. It is a great tea for the morning to get you ready for the day. Soft and silky, this tea offers bamboo and ginger flower flavors. It leaves a natural and refreshing sensation in your mouth and throat. The tea offers a strong mouth feel that coats your mouth, yet finishes with a soft rosé and apricot aroma. This tea is SGS certified for having no pesticide residues. Brisk, sweet, full-bodied and possessing a long savory aftertaste, this tea has all the good qualities of a raw pu-erh. A great morning tea. This tea is full-bodied, vigorous, balanced, and possesses the unique Menghai characteristics. This cake is expected to be a prized collective item in the future. After reading "The Tea Girl of Hummingbird Lane", I was inspired to try this tea. The sampler pack was perfect for that and I am enjoying making my way through the various teas. I loved this sampler! Each flavor was so different - it was the perfect way to expose myself to the many varied types of raw and ripe Pu-erh teas! I bought this sampler along with the book The Tea Girl of Hummingbird Lane as a gift. It was well received!